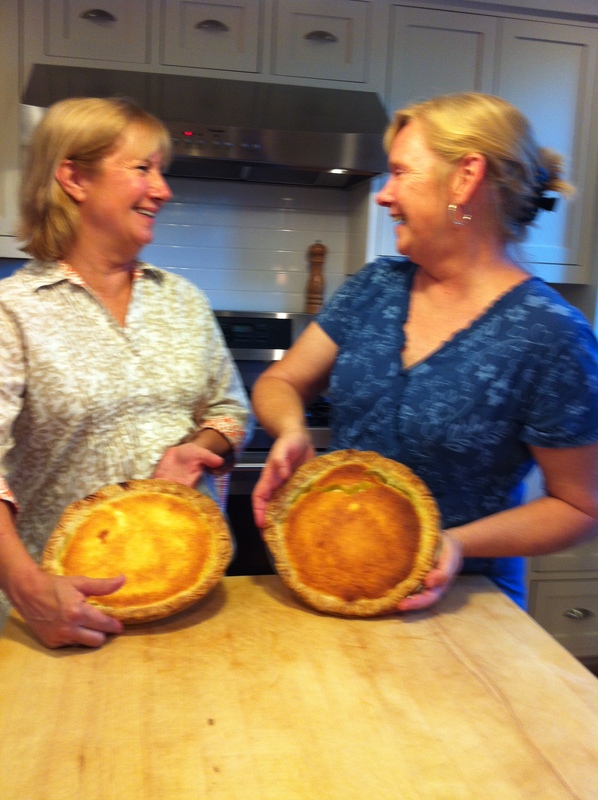 My sister Dana recently won 3 prizes in a pie contest, out of 78 entries. She won Best Crust. (and she got BACON for her prize) Who better to help me conquer my fear of pie crust? Last Saturday at noon I went over to her house with a bag of Vidalia onions, portabella mushrooms, and Gruyere and Baby Swiss cheeses. We invited our parents and our hubbies for supper. It was time to sink my Pie Panic once and for all. We planned to make 4 pies; 2 onion and cheese for supper, and 2 lemony pies for dessert. Dana had a mountain of butter chilled, fine flour, fresh garden greens for salad tossed with a lemony vinaigrette. 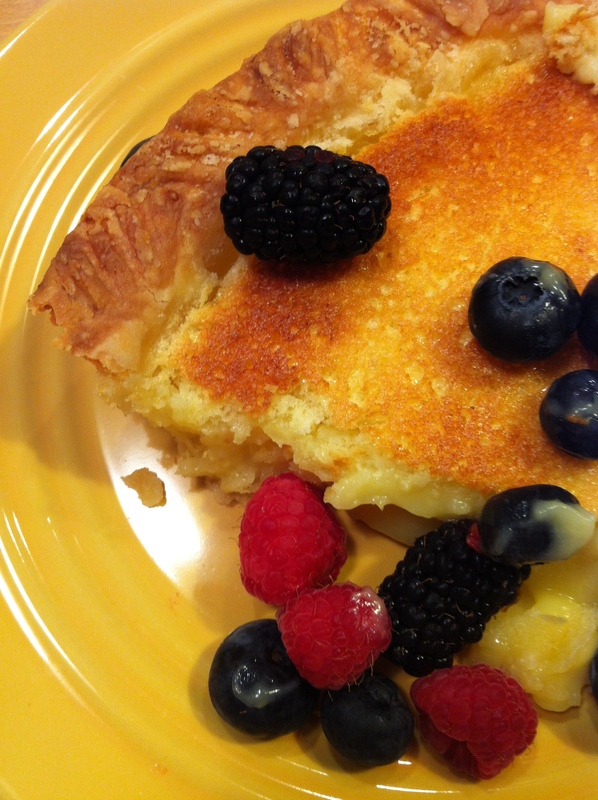 She also had fresh berries for our dessert pie. I had 3 bottles of 2007 Zinfandel and 2008 Los Braceros blend, just shipped from Robledo Vineyard in Sonoma. On a side note: Reynaldo Robledo immigrated from Mexico, a migrant worker, at the age of 16 in 1968. He now makes wines that are served at White House dinners and owns the first vineyard operated by a former migrant worker. If you appreciate good wine, check out Robledo! We began by measuring out 5 cups of flour. Unfortunately, Dana left me unattended and I may have counted 6 cups. Maybe. Could have been 5. (You see why I had pie panic?) I decided that I was confident in the 5 cup count, so we moved ahead. We added a little salt, a touch of Sugar in the Raw, and chopped 4 sticks of cold butter into half-inch cubes. Dana said the secret to making good pie crust is keeping the ingredients cold while you’re making it, and to leave the chunks of butter kind of big for a flakier crust. When mixing the ingredients, you want to keep your hands out of it so you don’t melt butter by warming it up. We used a pastry cutter to mix the dough into a coarse, bumpy texture. This is when Dana said the dough was behaving differently, perhaps too much flour. She sprinkled it with water and worked it a little more. Then she confessed to having used a new flour that day for the first time. It was immediately obvious to me that the new flour was the culprit, not my measuring. Ever the gracious hostess, Dana assured me the crust would be fine. We divided the dough into 4 equal portions, patted them into circles like big hamburgers, wrapped them in plastic and put them in the fridge for an hour to chill. Four sticks of butter. One meal. Life is good. Dana decided to run out and buy another pie pan, which left me to slice Vidalia onions, very thin. Lots of onions. They made me cry. First I peeled the skin off the onions and then I took off the outer layer of onion. 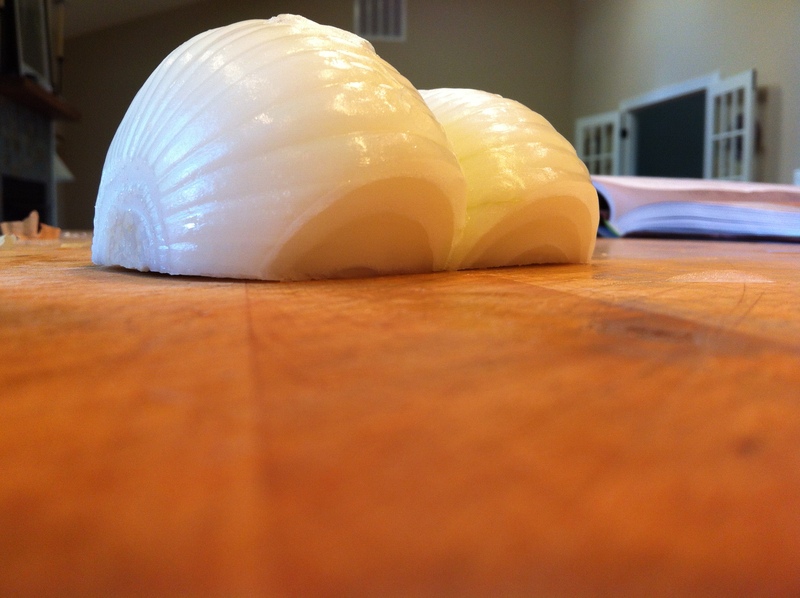 I cut the onion in half and began to slice underneath the half. According to Dana, this prevents those onion strings you get when you slice the onions in circles. It’s actually true! Not that I ever doubted my big sister’s word. As I finished slicing the last onion (eyes watering profusely) Dana returned from her store run and said “Oh, I should have done that. Onions don’t both er me because I wear contacts.” Funny woman, that sister of mine. While the onions and mushrooms simmered, we got the pie crust dough back out. This was the fun part. We unwrapped a round of dough, place it on a floured mat, dusted the top of it with flour and then whacked it with a rolling pin about 4 times, turning it slightly after each whack to flatten it a bit. We were liberal with the flour; we put some on the rolling pin, the crust, the little pie mat, and on the floor for good measure. Then we began rolling the crust, quickly, turning it a quarter turn every other roll, to keep it even, dusting it with flour on top and underneath to keep it from sticking. I had to get a feel for the rolling, turning, flouring. By the 4th crust, it was easier and I was learning how to manipulate the dough without damaging it. My pie panic decreased as we worked. That part of the process moved quickly. Everything needed to stay cold, so we handled the crust as little as possible while rolling it out to about an eighth of an inch thick. We put the onions in a pan with olive oil, and yes, MORE butter. The onions had to cook for about 15 minutes on low heat, then we cranked the heat up to caramelize them. It smelled divine in that kitchen! We added the mushrooms, let the liquid cook off, and then added Madeira. The recipe called for Marsala, but we figured Madeira was close enough, and it’s the only sweet red we had handy. Dana added a bit of lemon to cut the sweetness of the wine, and some freshly picked thyme from her herb garden. Dana showed me two ways to pick up the crust; one way was by rolling it up onto the rolling pin, then unrolling it over the pie pan. The other way was to gently fold the rolled crust in half, then in half again, so you’re picking up a triangle of pie crust that is 4 layers thick; then you place it in a quarter of the pie pan and unfold it into place. We trimmed the excess to about a half-inch outside the pan edge, then put it back in the fridge to chill again. While the crust chilled, I grated 10 ounces of Gruyere and 6 ounces of Swiss cheese. A pound of cheese, a pound of butter. Heaven. Then we took the crusts out of the refrigerator, finished trimming them up, made designs in the edges of the crusts with floured forks. 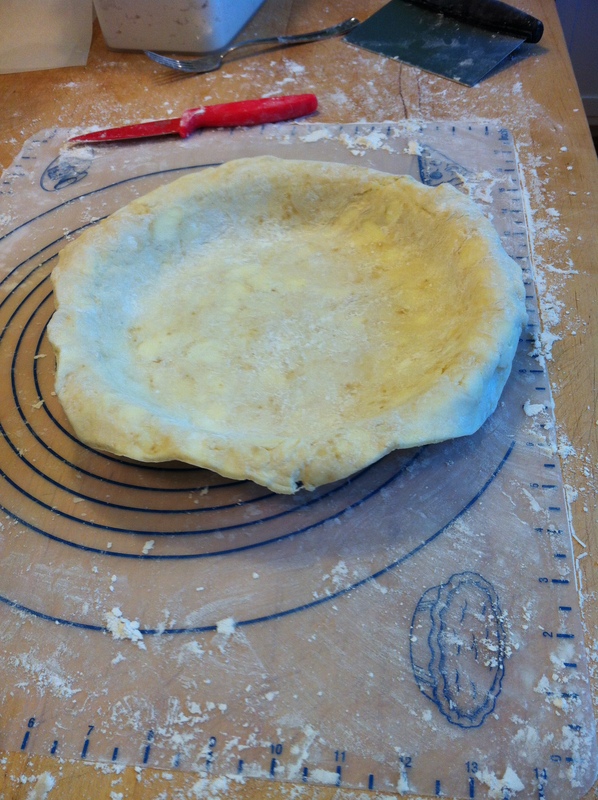 We cut parchment to fit inside the pie crust and lined the bottoms with pie weights. Into the oven they went. The shells needed to be pre-cooked for the onion pies since the onions and cheese did not need too long in the oven, and we wanted to bake the filled pie crusts just before meal time, so they would be hot and bubbly and yummy. It was at this point that I had to leave to show some real estate. Dana made the beautiful lemony dessert pies and the salad dressing while I was gone. When I got back we put the onion pies in the oven. It was a beautiful evening so we set the table on the screened porch with a view of the mountains and the chickens in the yard. The wine was outrageously good. Mellow and the perfect complement to Gruyere. The onion and cheese pie was PRETTY AMAZING. It was like a pizza crust almost. (Okay, I think I put the 6th cup of flour in.) 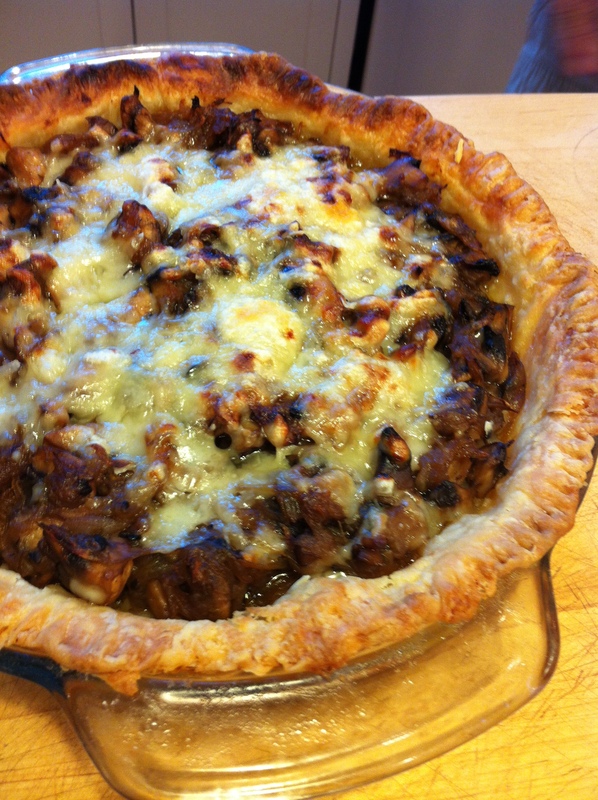 But it tasted great, and I no longer fear pie crust! With a little practice, I can feed my family delicious meals with 4 sticks of butter on a regular basis. The fresh salad greens with lemony olive oil dressing made me grateful for home gardens and tender lettuces. The company made me grateful for family and being here with them, especially to have the joy of making pie crust with my sister. The six of us ate both onion pies. Then came dessert. After all, we had only consumed 2 sticks of butter at that point, we could hardly stop. The lemon pies were swoon-worthy. Light and slightly tart, with fresh blackberries, raspberries and blueberries. I cannot wait to make another pie! We have a peach tree and a pear tree, both loaded with fruit. I plan to experiment with homemade pie crust and cobblers next. And maybe a meat pie. Dana won the Meat Pie category in that contest with a Canadian recipe, so I may as well let her teach me that one, also. I will even measure more carefully. Soon the recipes from our lovely dinner will be on Dana’s blog. Visit http://www.danasplate.com to learn more. Absolutely loved this story about pies. I wish you had been, too! Miss you both!